You know what I really like about Al Bazar? I like the fact that that it has an aura of quality and style and yet it is not about being the most expensive or most exclusive. 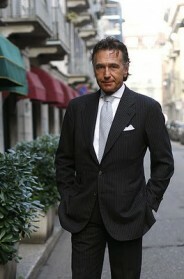 As much as I love Domenico Vacca and Luigi Borrelli here in New York they both have a very elitist sensibility. Maybe it is just me but I don’t think a person should have to pay a boatload of money to get good quality clothes that also have a certain amount of style. As I mentioned in the previous post I also love the commitment to good service at Al Bazar. When I visited Al Bazar in January they had a specific salesperson to work with their large number of Japanese customers. Lino is like a rock star in japan. I bought a copy of Leon, a super sartorial japanese mens magazine, and he was voted the top mens store in Milan. Well I’m guessing he was voted top, I don’t speak or read Japanese but he was listed first and had a big number 1 next to him. I will do another post about Al Bazar when I visit again to do some Summer shopping. Do you know what fabric Mr. Ieluzzi’s jacket is made from? It drapes so well. Great brown buttons too. I should go visit Al Bazar because I don’t own a suit yet…yeah I know, shame on me. Couldn’t agree more. 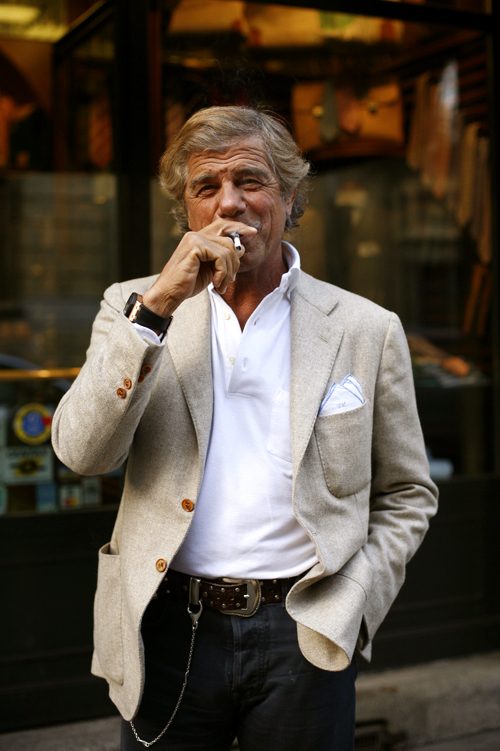 Sartorial “turf,” particularly with menswear, is defined tragically by two factors; dollars and access. 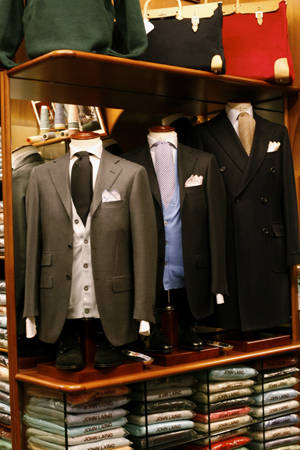 Its rigidly tiered structure of price, quality and design alienates an entire segment of the population that will never know or experience the essence of style, quality and sartorialism – not due to lack of interest, but choice and cost. Two factors that in an open consumer market shouldn’t be. To bring a high quality ready to wear menswear collection that incorporates the same elements of bespoke tailoring (fit, fabric and construction) at a price an accessible price fills a much neglected void int he consumer marketplace, and I’m thrilled Al Bazar is doing just that. Hi, is great, i´m agree with you, simply great. Hello there. Great post Scott! Is there anywhere in New York that comes close to Al Bazar in terms of style, quality and price. I would love to buy some shirts but can’t afford to fly to Milan to do it. Any suggestions would be fantastic. Great tip! Thanks for the address. Now I know where to go to to Milan! Are the pant chains stin in fashion for men? I thought that was last years style. Hey athenian guy:drop me a line! It is not every day I see another greek in here! Lino, finally, a debut in New York! He has just embarked on his new shop in Tokyo, which is called Azzurro Tokyo. Amazing photo. I can feel the charisma oozing out from my computer screen. Gotta love Italy. The clothing displayed is incredible..If only we in the states had access to such exquisite clothing..internet opportunity!! This shop is one of my favorite shops in milan.I always visit the shop when i stay there for a few days. 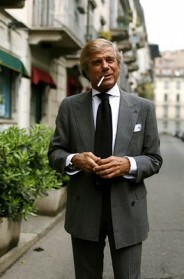 I want to be cool like Lino Ieluzzi when I grow up!!! From what I’ve read of the store, I must go there. The photo of Mr. Ieluzzi exudes a cool that reminds of Herman Leonard’s photo of Jazz legend Dexter Gordon. In all earnestness, exactly what kind of prices are we talking about such high quality goods without “elitist sensibilities”? 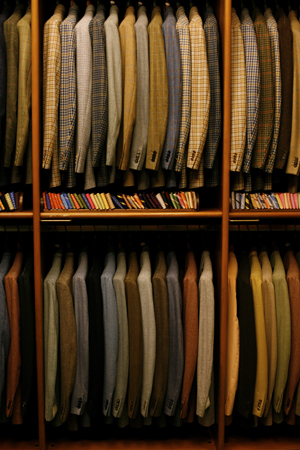 Just look at all the Glen Plaid on those racks; that really surprises me. I didn’t think anybody really wore that anymore, but I’m glad people do, because it’s brilliant. I love these photos. The bits you write about these guys are great to read! Does anyone know if they ship to the US ? Yes, in japanese fashion world a genre called Ita-oya style (italian old buddy style) is very well established and personally I find it absolute class! I’m japanese by the way and I wouldn’t mind translating the magazine photo if you want to verify his top-ness! I liked your blog, it shares much information about Al-Bazar. It offers best services to customers. Thanks for sharing.